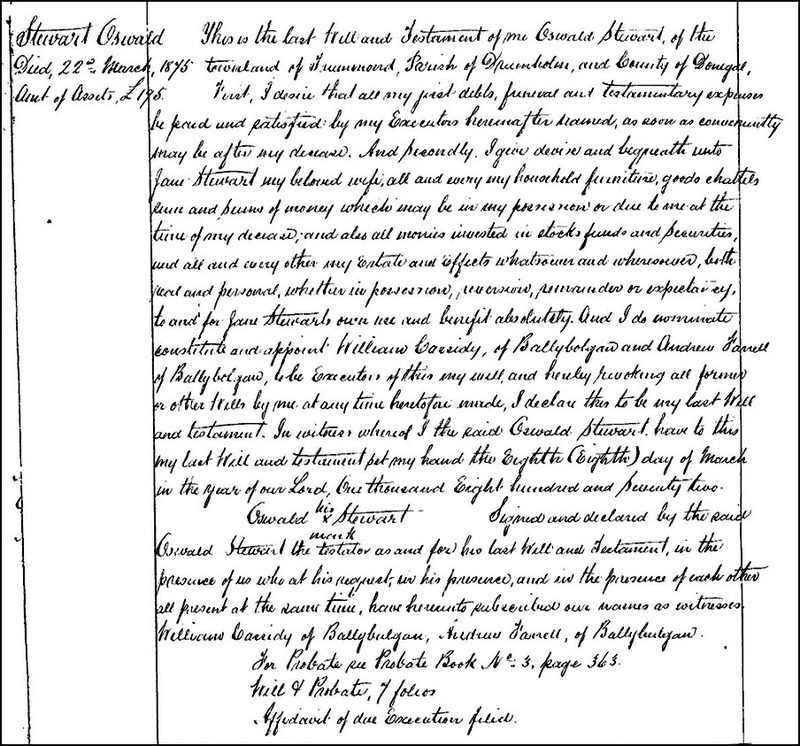 Reader Sharon Crowley came across an abstract of an ancestor’s 1875 will, filed in Northern Ireland, and couldn’t quite figure out what it meant. What exactly, Sharon wondered, was Andrew Farrell’s role here? Good question! Let’s start with what the record is, before we get to exactly what Andrew was doing. From 1858 when wills began to be proved in the High Court of Justice summaries of every grant of probate and letters of administration were kept in printed volumes known as will calendars. So the abstract Sharon found is from the Will Calendar, and it sets out really only the bare bones of what happened in this case. Now about our friend Andrew. What makes the reference to him confusing is that we’re used to seeing people mentioned in a will playing one role — say, a witness to the will or being named as executor. What happened here was that Andrew was both. • Both Cassidy and Farrell served as witnesses to the will. That required all three men to be present at the same time in the same place. Cassidy and Farrell first watched Stewart making his mark on the will, then each watched as the other signed as a witness. • On 22 March 1875, Stewart died. 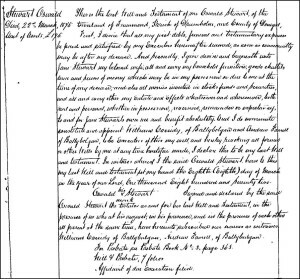 • On 24 September 1875, probate of the will was granted. And before that could happen, one of the witnesses had to go into court in Londonderry and prove the will. That witness was Andrew Farrell. So what Farrell did was tell the court in Londonderry what the circumstances were when the will was made, so the court could determine that the paper it was looking at was, in fact, Stewart’s will and that it was valid — that Stewart was of sound mind, that nobody unduly influenced him, and that sort of thing. Sharon has a lot to go looking for here. She starts, of course, with looking for any other surviving records of the estate and the probate process. The will copy at PRONI says “For Probate see Probate Book No. 3, page 363.” If that survives, that’s number one on the want list. An estate inventory would be terrific. The will copy says Stewart’s assets were valued at £195 — somewhere around £14,300.00 in today’s money using the retail price index or £85,100.00 using average earnings7 — not a fortune by any means but not too shabby. More on the Disestablishment of the Irish Church and it’s legal implications. In addition to giving the probate courts over to the civil authorities, the church set up an administrative unit for its own finances called the RCB (Representative Church Body), a trust. (1) For some reason, the RCB was not allowed by law to take bequests of greater than 30 acres. Apparently Irish law considers his nearest blood relative, Hester, as “Heiress-at-law” and next of kin. In that role, she claimed the administration of the estate (including receiving its income) from the RCB since they were not allowed to receive large bequests. The church(es) then sued her to retain the administration. The lead plaintiff was John Keane the parish rector and the nominal defendants were the beneficiaries including Clara Keane Motherwell. An instance of father suing beloved daughter. The court sided with the church. It seemed a decision with the right outcome but with some pretty dodgey reasoning on the line of what is the definition of “is”. But what do I know. The opinion is very informative, but with obscure legalisms. I’m happy to send you a scanned pdf if you’d like. The judge’s decision, I paraphrase, was that if the above is read literally, the sister wins immediate control of the estate and its profits, and the church must wait till everyone dies to get what’s left. However, if read “Distributively”, whatever that means, that since the wife Clara had no children the clock stops and the church gets control of the estate now. After much justification he sided with the distributive reading. He then quickly disposed of the issue of the RCB not being allowed to receive large bequests by saying that RCB wasn’t really receiving, but acting as trustee for the 3 parishes. The church won, though it’s interesting that the estate wasn’t finally settled till the 1930s. I’d be delighted to see that pdf, Bob — and I suspect the reason why the Church couldn’t accept large bequests was because giving land to the church took it off the tax rolls!